B&C Farming’s in demand seed potatoes are Safe Haven accredited. Grown on virgin or long break land we provide high health and quality seed. The business has been supplying customers throughout Europe in collaboration with Greenvale AP since 1989. We can provide you with a wide selection of varieties, in packaging of your choice, delivered or for collection. B&C Farming have invested in positively ventilated seed stores which help to improve seed health and mean that we can supply from Autumn to Spring; we can offer Accumulator treatment as well as approved fungal treatments. B&C Farming have expanded the seed operation in 2018 with a new state of the art store and grading line under construction as well as the introduction of seed cutting into the portfolio of services which we can provide. With our dedicated haulage operation, we can offer just in time delivery or if you would prefer it is possible to buy the crop ex-farm. We offer a range of pricing depending on when you require seed and any treatment. B&C produces some seed which has been planted to emerge and tuber initiate early so this is chronologically aged seed and breaks dormancy earlier allowing early planting and increased stem numbers. We are happy to supply the data to refine your seed rates. This also means that we are able to supply seed to customers in the Mediterranean, ready to plant in October. 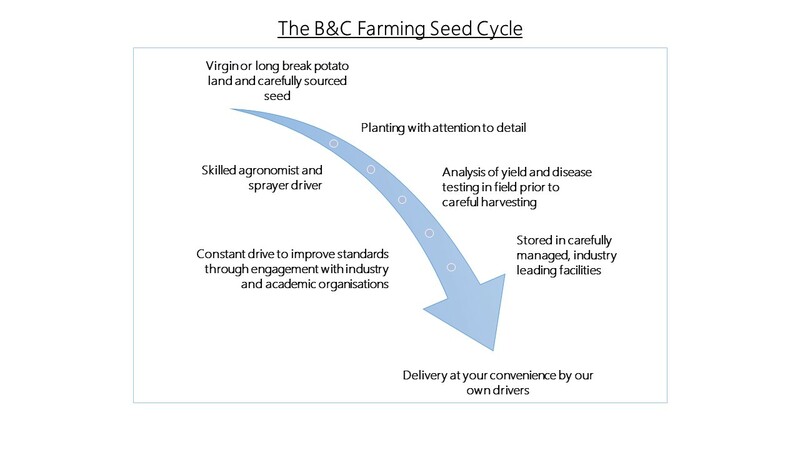 For seed enquiries please call Adrian Neill, on 01603 228640 or speak to your local Greenvale seed co-ordinator; alternatively make an enquiry by contacting us.